In the whole world there’s nowhere better for “Freedom” then in your Tasmania Campervan or your 4WD Bushcamper for your holiday in Tasmania. Explore off the beaten track in your bushcamper or cruise along in your campervan to a new horizon. Wander into the most spectacular mountain and lake scenery imaginable from trout-filled lakes to snow capped mountains, lush native forest to sleepy townships, golden sandy beaches to grass parks. 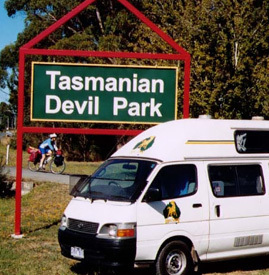 Nowwhere is too far away - so enjoy the “freedom" of Tasmania in your Tasmania Campervan and 4WD Bushcampers. If you love the outdoors then you are guaranteed to love Tasmania.